Addiction is often associated with clinical depression either as a result or cause of substance abuse, or both. In severe cases after prolonged addiction, professional treatment for depression is likely to become essential for the welfare of the sufferer. Whether symptomatic or co-occurring, the negative thoughts that accompany depression can be extremely detrimental to progress in addiction treatment. The overwhelming feelings of hopelessness and isolation with depression are very real and often extreme. When someone is suffering from clinical depression it is not possible for them to ‘get a grip’ or ‘buck their ideas up’ and to suggest so is to trivialize what is a chronic and debilitating disease. Nevertheless, thoughts, words, and deeds are extremely powerful and just as they can shape someone’s life into anxiety and depression, they can also have quite the opposite effect. This is because how people think has a direct impact on the way they experience the world around them. 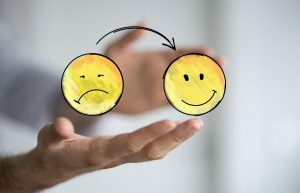 Thoughts are energy forms and have similar negative and positive forces and in structured depression treatment, patients can learn how to create more positive thought processes and responses to help them cope better with difficult situations going forward. Another key feature of depression treatment is to explain the power of thoughts and how to deal with the internal dialogue many people have continually running in their minds. This voice can be their harshest critic or their best friend, and often has a direct influence over the decisions and choices sufferers make. Holistic mindfulness techniques like yoga and meditation are often employed in treating depression as they focus on deep breathing and cleansing the mind from its internal voice. The objective in addiction and depression therapy is to silence the very powerful voice that enables addiction and give prominence to more positive thoughts that will enhance the patient’s ability to find happiness in life. The negative cycle depression can cause manifests itself to the sufferer as a self-fulfilling prophecy that keeps them trapped by the disease if left untreated. By holding negative expectations in mind as fixed outcomes, sufferers draw negative experiences towards them. When their expectations are met and failure has occurred, it fuels their anxiety and depression further. In the same way, positive affirmations can provide a positive mental framework to create healthier thoughts and attitudes, negative reinforcement is equally potent in its detrimental effects. It is important for sufferers to adopt more positive behaviors as depression is often a disease that a sufferer has to cope with for many years. An example of the potency of negative thoughts during recovery is a sufferer of depression who thinks they are bound to fail in addiction treatment. In their minds, they are already committing to an outcome in which they relapse back into addiction. That sets out a direct path to failure and also provides an excuse for relapse and becomes a self-fulfilling prophecy. This is another illustration of the power of negative thoughts and energy and how professional help is beneficial in re-training the mind to produce more positive results in daily life.